That’s a long title for such a simple thing. Left Logic has the last HTML Entity Character Lookup you’ll ever need. No more scrolling through entity lists looking for a tiny bit of code just to type a simple character. Search for entity characters based on how they look. So if you need some sort of dash, type a regular minus sign and you’ll get everything that even slightly looks like it. Need something that resembles a P? Good, type a p and you’re set (see screenshot above). It’s fast, and couldn’t be more intuitive. Available also as a OS X dashboard widget, Firefox extension and search plugin. $100 Logo? Hah, yeah right. Those of you tired of hearing the same old arguments on why you’re too expensive and how your potential clients’ nephew and/or grandmother could do the same job for less pay will take solace in this designer’s rant. Godspeed. Who Knew is a design magazine taking on “difficult content” – ideas and issues that are commonly misunderstood and censored. Every 3 months, students graphically communicate texts considered complex, confusing and/or controversial – things that make us go, “Who knew?”. Who Knew studies the interpretive power of graphics and typography in the access, efficiency and transparency of information. Is your doctor killing you? Can a designer do good? Are you beautiful enough to survive? So, You’re Out of Ideas, eh? No problem, try the TDB Special Projects Idea Generator on for size. Hooray for randomness. This two-liner looked silly next to the thumbnail, but there’s really nothing else to say, so I’m filling this up with random text. Excuse me, I’m off to create an “exclusive shrinking apparatus”. Oh yes I am. Click "Accept" on the cookie consent banner to allow cookies. For those wondering, the song featured in the video is “Breathe Me” by Sia, found on the album Colour the Small One. 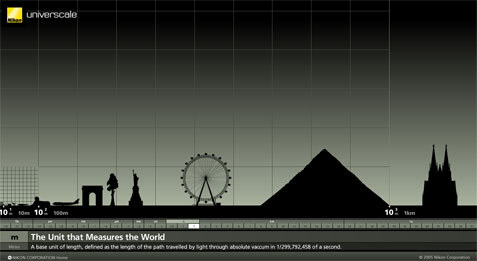 Nikon’s Universcale puts the universe in perspective, showing us all kinds of objects in relation to each other. Explore objects from the smallest of sizes to the largest known to man, from tiny protons all the way up to the outer limits of the universe. Universcale is an eye-opening Flash visualization and I actually wish school had been more like this. Try it out if you want to feel like a giant and a microbe all at the same time. Nice little discovery by Oyayubizoku: there is some striking similarity between the iPhone’s calculator app and Braun’s 1970s-era calculators. 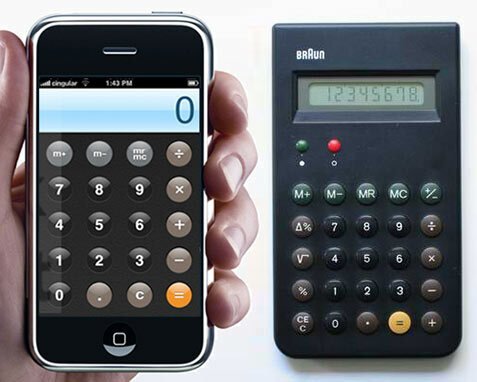 Before someone accuses Apple of design theft, however, it appears that this calculator is actually a part of Apple’s own history: the Apple Collection shows an almost identical, co-branded calculator. Erik Spiekermann, in his own words a Braun collector, puts up a few images of a 1962 Braun T100 world receiver that clearly appears to have inspired Apple’s design style. For the type geeks among us, he also notes that the iPhone version uses Helvetica for its buttons, while the Braun calculator uses its older sister Akzidenz Grotesk. Poly9 FreeEarth is a free Flash application that offers you a 3-dimensional globe to include on your website. FreeEarth supports superimposing of metadata (such as weather data or Flickr geodata), animation (such as flight routes), combination with 2D mapping tools, satellite image tiling, numerous celestial bodies (the solar system planets, moons and the sun), and some more Web2.0 gimmickry. Check out the FreeEarth website to see some of the neat applications it can be used for. You are currently browsing the position: absolute weblog archives for August, 2007.